'Tis a broken land of rock and bone, of poisoned dust and choking smoke. Nothing grows in the Ru Darklands save evil, and nothing dwells there but death. Long ago, the Uthuk Y’llan ravaged the land like locusts, consuming everything in their path, leaving only destruction in their wake. After the horde’s defeat at the end of the First Darkness, the Uthuk disappeared and their memory faded into legend. But the Ru Darklands begin to stir again as the demonic warbands emerge from the Black Citadel to spread chaos and destruction once more. 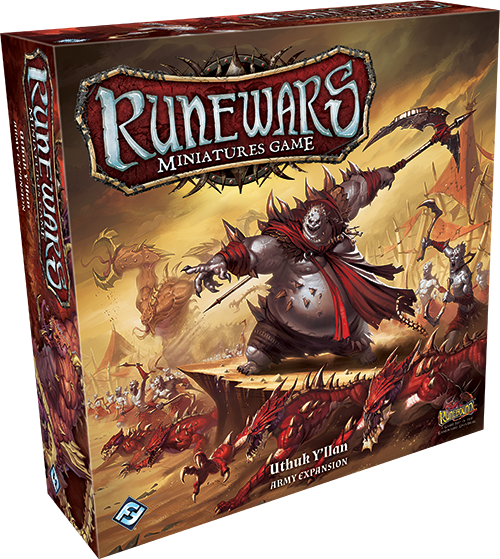 Fantasy Flight Games is excited to announce the Uthuk Y’llan Army Expansion for Runewars Miniatures Game! Build your swarming ranks with the twisted creatures of the Uthuk Y’llan as you hunger to bring Terrinoth to its knees. No tribesman of the Uthuk Y’llan is weak after surviving the crucible of life in the Darklands, but only the truly mighty can survive long in the front ranks of a Berserker warband. These fearless assailants make up the infantry of the Locust hordes. Infamous for the unearthly scream they unleash as they run frenzied into battle strikes panic into the hearts of their enemies. Any soldier who hears their cry knows that their opponent is the embodiment of evil and, while they appear close to human, they have no sense of compassion and offer no mercy. In battle, the Berserkers are whipped into a frenzy by witches of the Blood Coven. This powerful and encompassing insanity ensures a Steadfast nature, making them very resistant to any fear effects. The Blood Coven’s mind control also causes the Berserkers to lose all regard for their own lives, as their only cause becomes to destroy their enemies. As such, when the Berserkers engage in combat, they may choose to suffer one wound to gain Lethal 1 for the duration of the attack. But this frenzy cannot last forever; Berserkers can only use this ability twice during a combat. The Uthuk Y'llan’s cavalry is filled with fearsome Flesh Rippers. These demons, summoned from the depths of the Ynfernael itself, hunt the enemies of the Locust horde whether they be hounds, scouts, or saboteurs. Powerful Uthuk chieftans and sorcerers choose these steeds as their battle mounts for their swift movement and unholy ability to smell the blood beating in the hearts of their foes. However, the demons are nearly impossible for even their Uthuk handlers to restrain. Before the player who controls the Flesh Rippers reveals their command tool, they must perform a speed-1 maneuver. This relentless, erratic speed is what lends the demons power while engaging foes. When the Flesh Rippers are locked in combat, surges are the creature’s greatest asset. 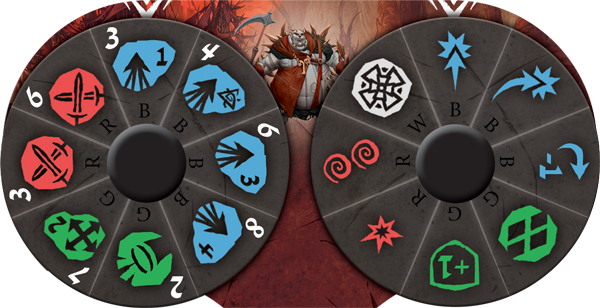 After rolling one red die and two blue dice, they have the ability to inflict damage on their enemy equal to each surge icon revealed. The demons tear flesh from bone before defenders can counter or even attempt to protect themselves. Even the Uthuk Y’llan fear these creatures and keep them constantly caged and guarded when they are not used in battle. 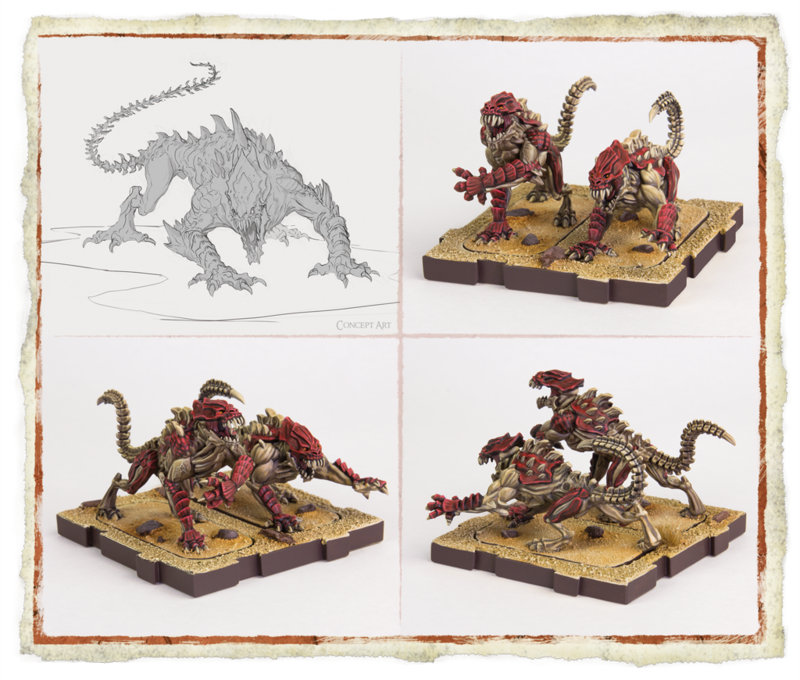 Flesh Rippers spawn quickly from the Ynfernael and a player may have up to nine trays of these fell beasts on the battlefield at a given time. One of the most revered of the Uthuk Y’llan’s ranks is their mighty and imposing hero, Ravos the Everhungry. The brutal Ravos embodies the ideal of the Locust Horde with his undying bloodlust as he consumes everything in his path. The perfect soldier, Ravos the Everhungry has three keywords: Brutal 1, Precise 1, and Steadfast [Fear 2]. That's hardly the end of his savagery though. There is no escape from the dread commander’s wicked curved blade that extends his attack range. During a combat, Ravos the Everhungry can spend a surge icon to inflict a wound on every enemy within range of one. What's more, despite his elevated rank, Ravos the Everhungry is as reckless as any Berserker. Before the End Phase, the player who controls Ravos must choose a unit at range one to suffer one wound. This attack does not discriminate between sides, and can affect enemy units or another member of the Uthuk Y’llan army. Ravos the Everhungry is one of the most terrifying beings that has ever engaged in battle upon the fields of Terrinoth. Merely being in the presence of the demonic Locust Horde commander is enough to shake the bravery of even the bravest soldier. To represent this, Ravos the Everhungry’s Ynfernael Presence ability inflicts one panic token on every single enemy after setup. A player commanding the Uthuk Y’llan can harm his enemy even before the battle begins! The bloodthirsty Ravos the Everhungry’s command dial bears two melee icons that allow him to attack either early or late within the round. A player can use him to front an attack and weaken their enemy, or wait until the demonic swarm has tired the Realm’s defenders and bring in Ravos for a final devastating blow. Ravos can either engage in direct combat or also use fear as his weapon of choice to inflict not one, but two panic icons on an enemy. Then, the commander may choose to leave his enemies to the Spined Threshers who thrive on the fear of their enemies. The Uthuk’s demonic army would not be complete without the monstrous beasts known as the Spined Threshers. In ancient legends, these creatures were summoned to the mortal realm by the river of blood left in the Locust Horde’s wake. The twisted crab-like demons rend flesh, armor, and even fortified stone with their monstrous claws, and strike fear into all who behold their twisted shape. Once a Spine Thresher has been activated, each enemy who does not bear a panic token within Range 1 to the number of unstable runes on the battlefield receives a panic token. In battle, a Spined Thresher is fear and chaos incarnate. Their enemies’ panic enhances their combat ability which states that if the defender has a panic token, the player controlling the Threshers may reroll one die. This increases the odds of a Spined Thresher tearing down bulwarks set against it and making meals of all too brave or too stubborn to flee. With five wounds and two stolid defense, the Spine Threshers are too resilient for anything less than a full military deployment to have a hope of stopping its rampage. Of course, Spined Threshers are difficult for the witches of the Blood Coven to summon. Each beast has a cost of eighteen, making it among the highest cost units in the game. Yet savvy commanders will quickly find that these monsters are well worth their cost for how much chaos they can sow on the field of battle. With even one Spined Thresher and an army of well-composed chaos, the Locust Horde can become unstoppable. Offer yourself to darkness and unleash the chaos of the Ynfernael upon Terrinoth with the mighty Uthuk Y’llan! 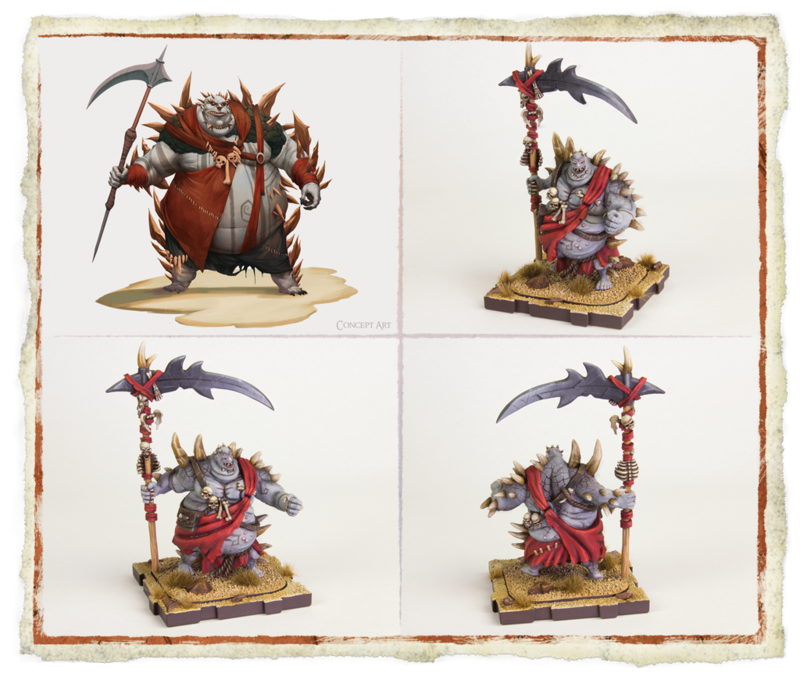 Look for the Uthuk Y’llan Army Expansion (RWM22) in Q4 of 2017!